How and why do we feel pain? This simple looking question is not without its depth because we actually cannot feel pain as an external sensation. The feeling of pain is our brain’s interpretation of electrochemical signals that shoot through our nerve fibers after stimulation of nociceptive neurons in our skin, muscle, joints or internal organs. It was evolutionary benefitial to make the perception of these electrochemical signals so very unpleasant (=painful) we would seek to avoid them, since nocireceptors are sensors of extreme temperatures, intense force, acid or noxious chemicals. Acute pain produced in our brain serves as a crucial alarm signal which aims to protect us from injury and behave accordingly. This is old news. Nociceptive neurons that convey pain signals were first described in 1906 by Charles Scott Sherrington, which brought him the Nobel Prize in Physiology/Medicine a quarter century later. However, since then, much work has been done in discovering how these nociceptive neurons work. On their surface, they are full of various ion channel proteins which sense the cellular environment and gate the flows of charged ions (e.g. Calcium, Natrium, Potassium) across cellular membranes and ultimately decide if a neuron can “fire” and shoot its electrochemical message along our nervous system. For each danger, it is assumed that there are several corresponding ion channel proteins that sound the alarm. So what if one starts messing with some of these channel proteins? Last year, researchers from the Laboratory of Ion Channel Research in Leuven, Belgium set out on a long quest to identify which channel proteins are responsible to detect heat. Several molecular heat sensors had been proposed, but experiments could not show deficiency in acute heat sensing; even for TRP-V1, a channel that gets activated by heat and capsaicin, the active component in chili peppers, only a minor effect had been reported in mice lacking this protein. 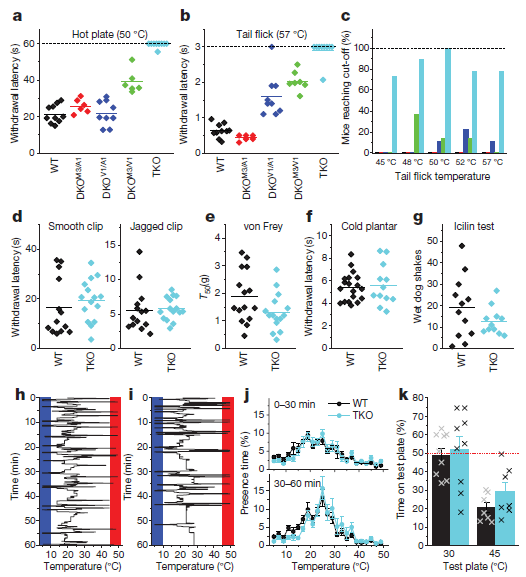 Which was bizarre, as selective depletion of whole neurons that are characterized as TRP-V1-containing (but not other neurons) caused almost total absense of heat sensing. The researchers suspected that there was another heat-sensitive ion channel protein, TRP-M3, that could compensate for TRP-V1 deficiency. 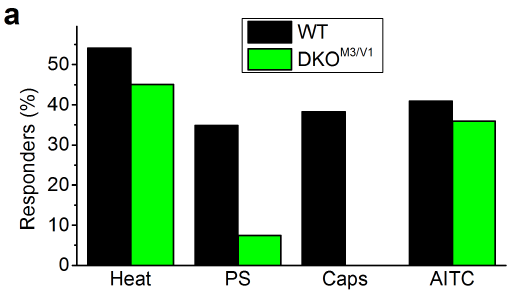 Again, they discovered that taken out both proteins together in (double knockout/DKO) mice still had little effect on heat sensing. They then decided to take a different approach, namely to isolate sensory neurons from their DKO mice and subject them to calcium imaging, a technique that allowed them to visualize when neurons get “triggered” by chemicals. TRP-M1 is sensitive to the neurosteroid pregnenolone, whereas TRP-V1 gets activated by the spicey chemicals capsaicin (chili peppers) and allyl-isothiocyanate (AITC, wasabi). To their surprise, they found that their double-knockout neurons were immune to capsaicin (chili peppers) but not AITC (wasabi). AITC mediates its function not only via TRP-V1, but also TRP-A1, yet another ion channel protein. So, in the most matter-of-factly manner befitting rigorous scientists, the researchers decided to go for the genetic trifecta and take out TRP-A1 as well. The generated triple-knockout (TKO) mice were completely normal by appearance and behavior, they also prefered moderate temperatures in their environment similar to their peers. However, differences appeared between the groups once their heat perception was put to the test. For example, when the researchers put normal mice on a 50°C hot plate, they usually take around 20 seconds to walk off. The TKO mice did not care, they would stay on the hot plate for a minute and longer, had the researchers not decided to end the experiment to avoid burns. Even more strikingly was the “tail flick” experiment, where normal mice take around 0.5 seconds to move their tail out of 57°C hot water, while TKO mice would voluntarily let their tails get burned until the researchers stopped the experiment after 3 seconds. Their work is an important contribution to the basic science of nociception, as well as laying groundwork for how we might be able to help patients with pain disorders by targeting ion channel proteins. It also shows that our bodies evolved many redundant and fail-safe mechanisms to sense danger in our environment. After all, while being immune to certain pains sounds fun in theory, not sensing them at all will eventually get you burned badly. This story is part of advances in biological sciences, a science communication platform that aims to explain ground-breaking science in the field of biology, medicine, biotechnology, neuroscience and genetics to literally everyone. Scientific understanding has too many barriers, let’s break them down! Do you have any questions or inquiries? Why not ask a scientist? AdBioS is a science communication platform that aims to explain ground-breaking science in the field of biology, medicine, biotechnology, neuroscience and genetics to literally everyone. Scientific understanding has too many barriers, let's break them down!